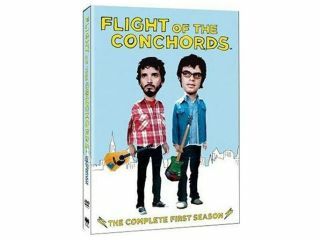 The season two premiere of Flight Of The Conchords, the hilarious HBO show, will debut first on the web, it has been revealed. The show, starring New Zealand comedians Jemaine Clement and Brett McKenzie, will hit the internet a full three weeks before it is shown on American TV Channel HBO, where the show will begin airing 9 January. Fans of the series – and if you have never watched, we highly recommend that you do – will be able to watch the first episode of the second series for free from 17 December, exclusively on www.funnyordie.com. Although Funny Or Die is a US-based website, which is overseen by Will Ferrell, Adam McKay and Judd Apatow no less, its videos are available to watch with a UK IP address. At the moment, the biggest video on the site is a skit starring Will Ferrell and Steve Buscemi. There's also a great video of Rick Astley doing a live RickRoll of The Macy's Thanksgiving Day Parade. Awesome!